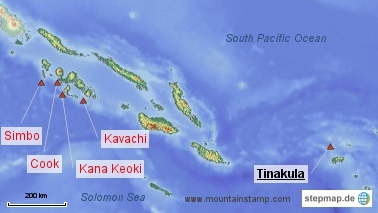 Kavachi is the most active undersea volcano in the world. Kavachi volcano is a submarine volcano located south of the remote Vangunu Island in the Solomones. Kavachi volcano is also known as Rejo te Kvachi, “Kavachi’s Oven”. Kavachi volcano with near surface eruptions every few years that often build temporary islands. Kavachi submarine volcano in different stages. The volcano has emerged and eroded back into the ocean at least ten times since it was first recorded. How a new island is made by show Mother Nature? Watch the Kavachi undersea volcano as it erupts underwater. Previous Previous post: Merapi stratovolcano 2006, 2010 Eruptions.